Welcome to the Newhall House! The house was built in 1888. 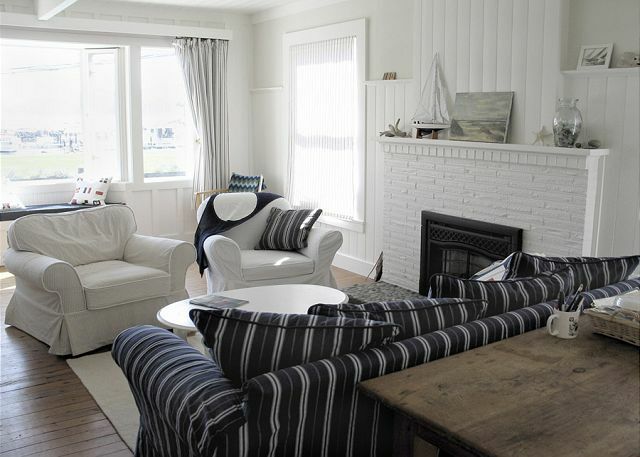 This classic beach home has been remodeled with care, integrity and with an eye for detail. The park area in front of the house. 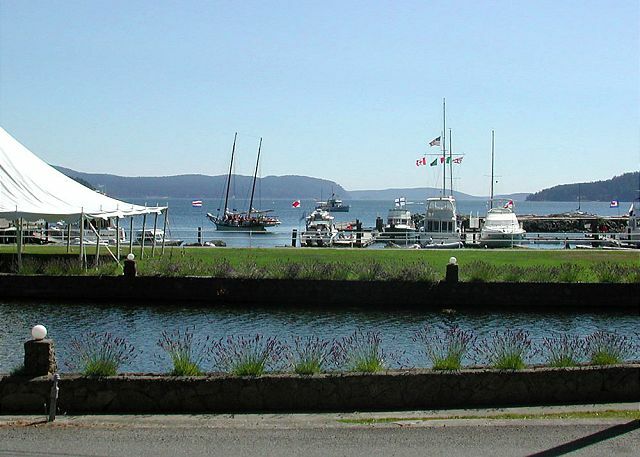 With the marina just across the street, you can arrive in your own boat as well as by seaplane. You can take wildlife cruises and kayak tours from the marina as well. The back deck of this home affords guests a quiet and private spot for enjoying the outdoors. 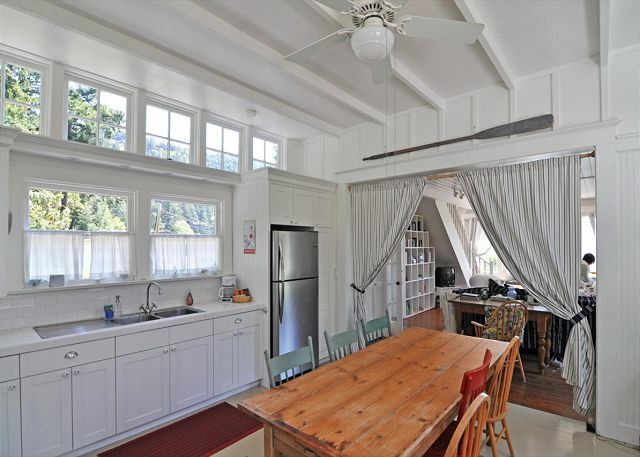 You'll enter Newhall House through this delightful sunroom. 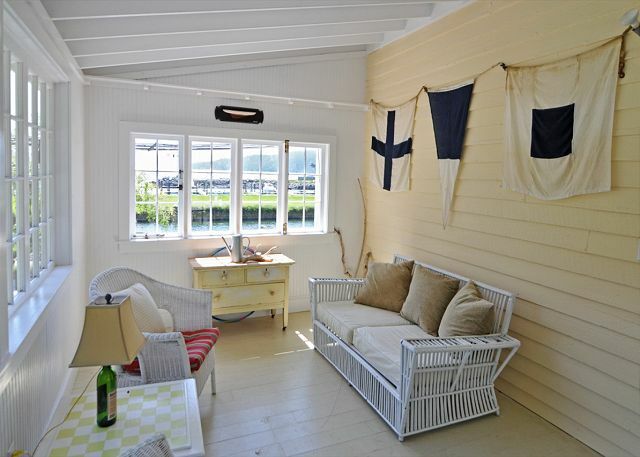 The home has a nautical beach feel. The living room is light and bright with a cozy gas fireplace. A view of the lower level looking towards the kitchen. An additional view of the lower level living room. Views of the marina can be seen out the bay window. The white wood work is gorgeous. The kitchen has all the tools needed to prepare a great island meal. An additional view of the kitchen. The door on the left leads out to a porch area at the back of the house. Inside the kitchen looking through to the main living room. The front master bedroom has a nautical décor and offers a window seat, water views, and sunny exposure. A close up view of the beautiful bay window. 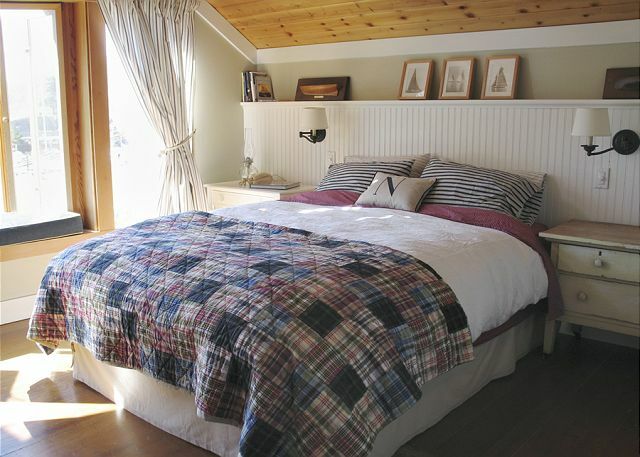 The second bedroom offers two twin beds and views of the trees in back of the home. 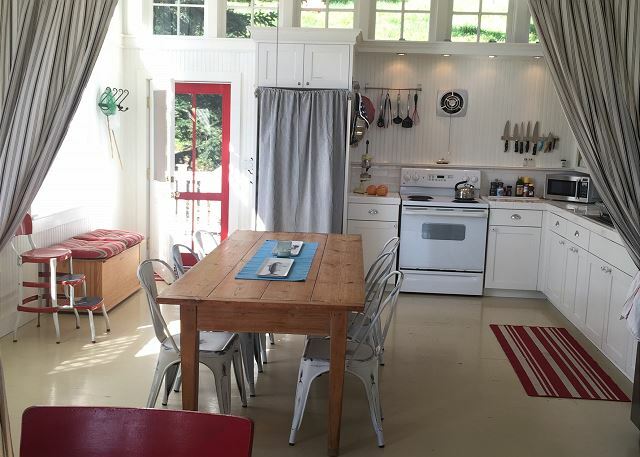 This charming vacation rental home is adjacent to Rosario Resort. 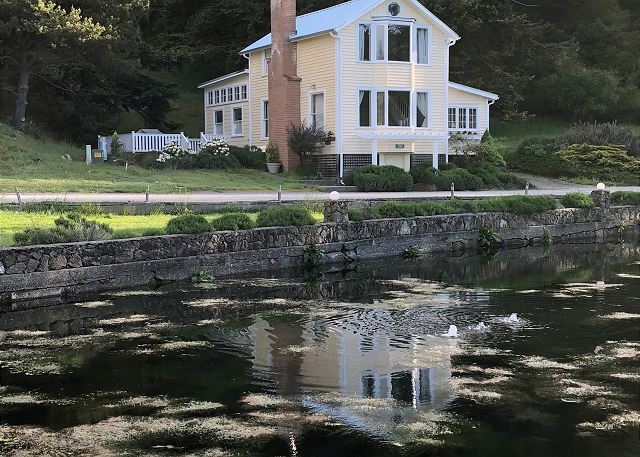 As the bow-tie pond and docks at Cascade Harbor Marina are just across the road from Newhall House you might consider arriving by seaplane or on your own boat! 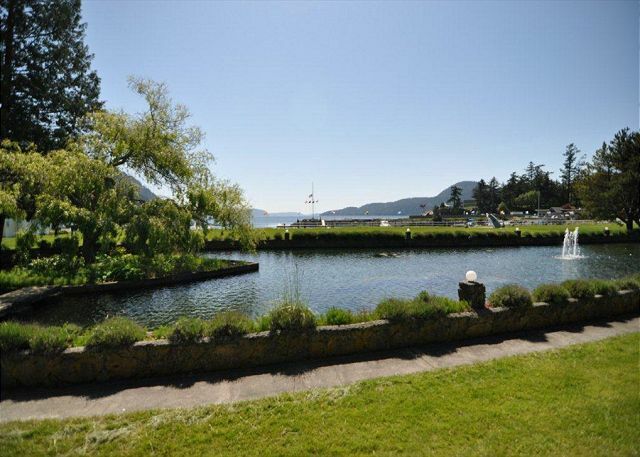 This enviable location also provides Newhall House with fabulous views of Cascade Harbor and East Sound and is within hiking distance of Moran State Park. We rented the house as a refuge during the conference we were hosting at Rosario. It was absolutely incredible. The house is so fresh, light and tranquil. I highly recommend it to anyone interested in staying within walking distance to hiking in Moran state park, The restaurant at Rosario, soaking in the spa, kayaking the sea. It's really a special place. Newhall House was even better than the pics and info provided. The location was great, the house was comfortable and greatly historical, and landing via Kenmore Air at the marina could not have been easier. 3rd time we stay there. We love it and will come back from France. Too bad the sofa bed wasn't ready and a dishwasher would be useful to save water. But we love the house! We had a wonderful time! The Newberg House was simple perfect for our stay. Absolutely beautiful, bright and light, very clean and with everything we needed. The location was perfect for watching the boats come in and out of the marina and made it easy to pop over to the cafe or store for anything we needed. This quaint historic house is comfortable and welcoming. The view is lovely and the location is terrific. We really enjoyed our stay.The house is great and location was perfect. Very charming and beautiful, quiet get away- rent it! My family and I(4adults) stayed here just after the quiet season hit(September 16-19, 2016). The area was definitely much more quiet than during the summer months- some restaurants weren't open, etc. but that's to be expected during the quiet season. The location is wonderful. You have head on views of the bay so you can see planes landing on the water, and watch the boats by the docks right from the couch. The house is about a 10 minute drive to the main town, Eastsound, so you can shop, grab a meal or pick up items from the grocery store. From the house to the ferry it's about a 25min drive. There is a small beach that you can sit by to feel the water on your toes just a one minute walk away. You can grab some food or drinks at the Rosario resort, which is a 5 min walk from the house. The resort also has a museum and spa. Mt. Constitution is a super short drive away as well. We would 100% rent this home again, no questions asked. Picturesque setting right on Cascade Bay. Loved sitting on the deck watching the sailboats come and go. The house is quite comfortable and very clean. All of the stuff you need for a relaxing week. Grill included. Go for it. Bring some books. My wife and I stayed at Newhall House for our honeymoon, and it was absolutely perfect. The house is beautiful and full of character, and all of the extra little touches (fully-stocked kitchen, fully outfitted gas grill, plenty of towels and soap/shampoo, etc) really set this place apart. It was also spotlessly clean upon arrival. The location practically on the Rosario grounds is gorgeous, and it's incredibly convenient to Kenmore Air seaplane dock. We would stay here again without second thought. We enjoyed a wonderful weekend at this peaceful getaway. The views and location of the property were perfect. Directions were easy to follow and the amenities were very nice. The property was clean and well-being maintained, having the full kitchen and grill were great for meal prep. The only shortcoming we experienced was that the amenity lisr indicated there would be two rolls of paper towels and some napkins in the kitchen. We only had a partial roll of paper towels which we quickly ran out of. The charming Newhall House is in a great location, so close to Moran State Park and Eastsound. Perfect weather our entire stay! Wedding weekend in the most classic island home at Rosario. It has that wow factor! The home is very well appointed with a gas fireplace to take the chill off the evenings, wonderful kitchen and sunroom. The view out the living room and master bedroom windows are postcard perfect bay views. Wonderful home, wonderful location. We had a great week staying here and hope to return next year. Wonderful location. Important to note, the second bedroom has 2 twin beds is and is very small. Master bed is good size and downstairs is great. Newhall House is beautiful, comfortable, very clean - exactly what you would imagine a vacation home should be like. Very close to Moran State Park, wonderful hiking, good food, and great scenery. This was a wonderful escape to a truly relaxing environment. Our favorite experiences were the Rosario Mansion and Mt. Constitution. For us, we recommend it as an adult vacation. The home is beautiful and very well kept!! The only "wish" item would be a bathroom on the main level. Our family had a very relaxing stay at Newhall House. The house is bright and cheerful and the kitchen was very well-stocked. We spent hours in the late afternoon settled into the comfortable chairs in the living room reading and talking. Thank you! A very warm inviting spot, wish it had another BR and 1/2 bath really only 1 couple can stay here with up,to 2 children. However I feel the holiness that the family has created, and everything is perfect! Just left! Want to come back already. Think this was our 6th visit to The Newhall House which seems like "our home away from home". It was our first time on Orcas island and we could not have asked for a better location of this rental house! Overall, the house was clean and comfortable. It has no central air conditioning and it was hot hot hot in the afternoon but pleasant once the sun went down. Renting the house was easy and a great addition to our stay on Orcas! We would stay here again and hope to return very soon! Thank you!!! 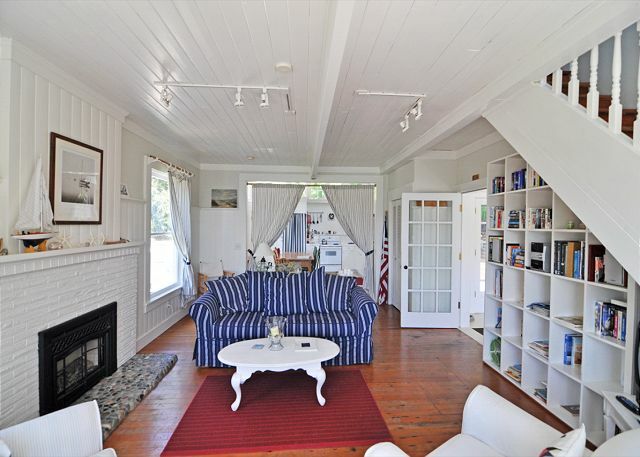 A beautifully restored water view cottage, just opposite the Bow Tie Pond Marina at Rosario Resort. Our second time staying at Newhall House. Kids loved walking the beach at low tide, discovering crabs and eels hiding under the rocks. Close enough to enjoy the Rosario amenities, including getting to feed apples to the rather tame deer that live on the property. Home is very well appointed, and the back porch was a wonderful place for us to dine as a family. We'll be back again. 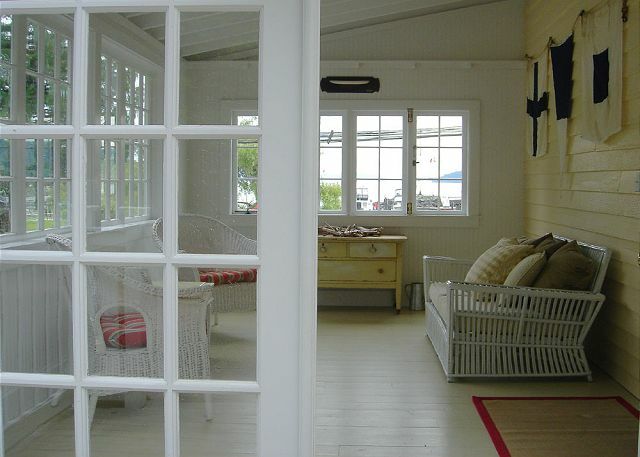 This home is adorable; the location is beautiful, the furnishings are perfect. My only complains are that the kitchen was not very clean when we arrived, one of the twin beds smelled of urine, the master mattress is a bit hard. There were three of us, we all had Verizon wireless and were not able to use our cells due to lack of reception. The wifi is very slow and comes and goes, so can't really count on being able to use your laptop. The house's phone is old fashion so you can't leave the kitchen when using the phone. Having said all that, I do not regret our stay as the house is very very charming and we loved being there. 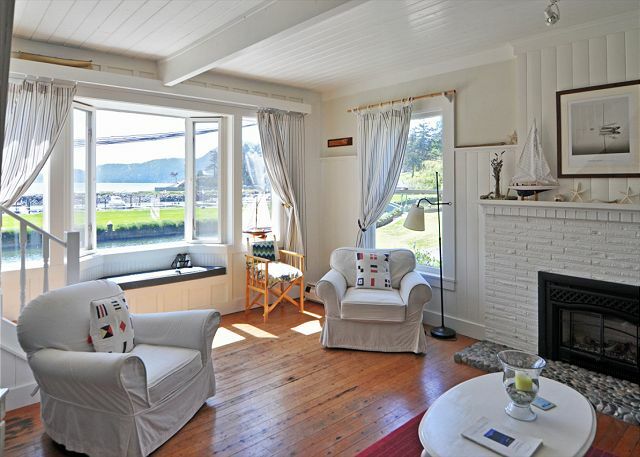 Lovely historic seaside cottage as aesthetically appointed as its environment, and its amazing views. Both cottage and views are a treat for the eyes. We loved it! Lots of "wild" deer, that the children loved being able to pet. Perfect peaceful location, but with the convenience of a restaurant, mini store, museum, and state park within walking distance. In spite of its peacefulness, lots to do on the island, such as hiking, biking, kayaking, horseback riding, shopping (at Eastsound), etc. 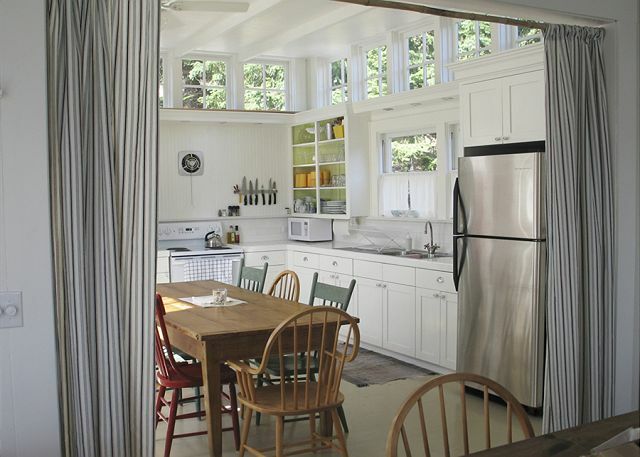 Cottage kitchen is great--all you need. Living room is very comfortable and beautiful. Minor suggestions pertain to the bathroom: more toilet paper, place to lay toiletries and clean clothing when showering, and a working hook for the bathroom door... and the porch doesn't seem to have much use as it's set up. Internet does not work well--basically not able to use internet or cell phones. Also, didn't see any DVDs for the player--would be nice to have music and movie options, but TV reception excellent. Those minor points aside, this was one of the best vacation spots ever, we loved the beautiful seaside cottage, and everyone voted to return. Thank you. Loved it! The park across the street was the perfect extra space for our kids, ages 7 and 9. They could play there while I made meals. We enjoyed looking at the boats and looking for sea creatures at the marina and playing on the beach across the street. The home is well-stocked and perfectly laid out for a family of 4. We couldn't have found a better place to stay on Orcas. Newhall House is even more beautiful than the photos suggest. A really lobely house, very comfortable, and in an ideal location near Rosario Marina, Moran State Park, and Eastsound. The only downside is that you can see Rosario's pool near the house, and our 3 year old son was really disappointed that we couldn't use it. The house is in a great location close to the beach and the state park. The house is very bright and was great for just lounging around. But there were a few problems. There was a load of wet mildewy laundry in the washing machine and a load of towels left in the dryer. When we called the property management service all they said was to make sure you wash it in hot water and maybe add some Clorox. We ended up rewashing the sheets and towels in the washing machine and folding them all. Not Something you want to do the first thing on vacation! The refrigerator had food stains in it. I needed to clean it up before I put any food in it. Also they need a new BBQ. The tubes to the burners were rotting out and only 2 of the 3 burners worked. It did not get very hot, but I guess it still worked well enough to cook a few hamburgers. Overall, it just need a real good cleaning. But other than that, it was a very nice place to stay and would stay there again. I just hope they have it cleaned before I get there. We are very sorry about the laundry situation. The appliances were malfunctioning, we were coordinating repairs, and somewhere in doing so it appears there was an oversight in the housekeeping. I assure you that we do not leave laundry for the guests to do! Come back soon so we can make it up to you. Newhall house has a wonderful view, is very warm and comfortable and has everything you need. Would stay again without a second thought. The Newhall House's rich history added to the charm of the updated amenities. Amazing views, and comfortable furniture lent itself to the ultimate relaxing vacation. Proximity to both Eastsound and Moran State Park makes Newhall house the perfect Orcas Island vacation rental. Newhall House is just adorable, feels like it belongs in Cape Cod. Historic, original squeaky wood floors and all, but clean & white & cheerful. Bed comfy! Whoever redid this place really knew what they are doing and the photos of the project are a nice touch. Amazing view, the pictures don't show it well - you are right across the street from the water and can watch the boats and seaplanes come in and out of the harbor. Super spot for a couple, small family. Stairs pretty steep, can be tough with a suitcase and the bath lacks counter space, but that's no biggie considering the trade-off of character and comfort elsewhere. We'll be back! Taking all in consideration it was fine. very dirty..like no one cleaned....what else was not clean?! Highly recommend, many thoughtful touches make this a great place to stay. From the entrance through a sun porch, to the open floor plan overlooking the harbor, and the red squeaky screen door that leads to the deck off the kitchen, our family felt very at home in this tastefully decorated, comfortable home. Easy walking to marina and resort, hike to Cascade Lake without having to drive, and enjoy the sound of float planes landing in the harbor. We'll be back. Newall House was absolutely lovely. It is located just across the way from Rosario Harbor. The house has gorgeous views of the water! The house has all amenities, including a cozy terrace with a grill. Newall House is charming and historical too as it was originally used as a post office in the 1900s. The location is perfect for families with children and is conveniently located. We rented Newhall House along with the neighboring house, Sea Watch, to accommodate a large family gathering. The Newhall house was expertly and charmingly decorated, with comfortable furnishings and perfectly situated to take advantage of the gorgeous harbor view and Rosario Resort amenities. We give it a 5 star rating. It was perfect for us. Fantastic location on Orcas, right near Moran and with trail to Cascade Lake just down the street for an invigorating hike without getting in the car. The house was beautiful-my only negative comment is that it is old so it is creaky (floors, doors), so if you are a light sleeper and you have people up at all hours of the night, it may be a little on the noisy side! However, the superb location, thoughtful details, and sheer beauty make this home one of the best we've ever rented. Also loved the photo album from the owners, showing their renovations. Highly recommended! Incredible view right across the Marina and Seaplane dock. Doesn't get better than this. The house was very inviting and comfortable. We had the best sleep of our lives in this house. We couldn't have been happier with our choice of the Newhall house--it is even better than pictured on the website. 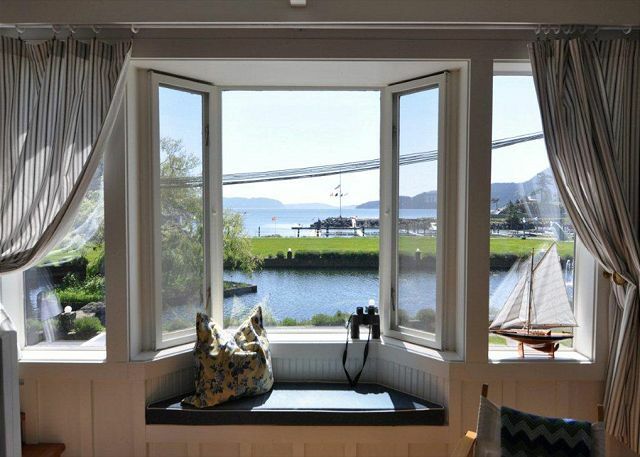 For landlocked midwesterns, the picture windows and outside deck looking directly over the bay were amazing, and we enjoyed watching the sailboats and seaplane come into the marina. Even with the Rosario Resort down the road, the place was quiet and very private, which we loved. Old style ample eat-in kitchen was a great place for casual meals and for games. Everything you need there! We did run out of toilet paper, and one of the living room lamps didn't work...very minor issues. Also important to open the windows to let the air flow through the upstairs, which can become fairly warm even on a mild day (low 70's) outside. We did fine with the one bathroom for four people...this is how we all used to live, folks! My kids want a couch like that! Hi Mary, Sounds like you discovered why Newhall House is one of our most popular homes!We're happy you enjoyed your time on beautiful Orcas Island. My husband and I, along with our dog, stayed for three nights over the Christmas weekend. We loved the house, especially the kitchen and dining room. The views of the harbor and marina from the living room and bedroom were awesome. Everything was spotless, and my husband, being a sailor, loved the wealth of nautical books and decorative accents. We will be back! 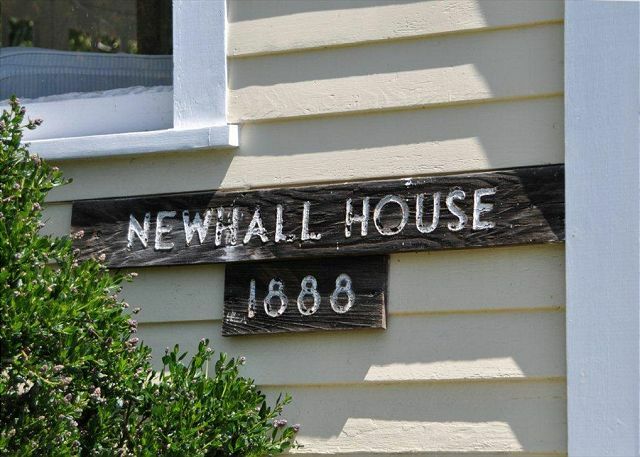 My husband and I loved our stay at Newhall House! The home is charming, cozy and the view is beautiful. We loved the openness of the downstairs and all the windows. The kitchen was well stocked and spacious. The location, right next to Resario Resort was perfect for walking our small dog and we actually hiked from the house up to Cascade Lake (although steep!) We had a couple of meals at the Mansion Restaurant and picked up snacks from the Marina's small store (although closed during the week at this time of year). We also had a massage at the Resort, which was handy. The only negatives are the bathroom is upstairs and the stairs are narrow. I think the size of the home lends itself to a couple or a small family. I'd definitely stay here again! We rented it for our sons wedding and it was very convenient and roomy. Lovely location. Great little house. We enjoyed our stay very much. We spent four nights at the Newhall House and absolutely loved it. The house is adorable and has all of the comforts of home. The owners really have put a lot of thoughtful touches to make our stay relaxing and comfortable. The location is great...there is a grass area for kids to run around, the harbor to watch the activity of the yachts and seaplanes, and a great pebbly beach (lots of sea stars visible during low tide)! The resident deer visited every day and were quite friendly. We loved our time here and hope to come back again! We're so glad you enjoyed the Newhall House and hope to see you soon. The location of this house is great. Right on the water and marina. 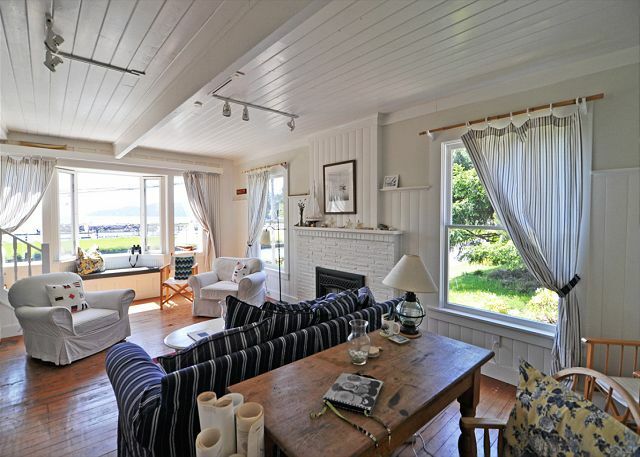 House has a gorgeous view of the sound with boats and sea planes coming in all day. The home is more historic than I anticipated. Cute house with all the amenities one needs for a vacation house. Only two negatives is the bathroom could use some updating/restoration and the dishes were dirty upon arrival-had to wash them myself before I could use. Overall a great convenient place to stay. We'll be sure to address the dish washing to our housekeeping staff. Glad you enjoyed your stay! We just returned from a wonderful week at the Newhall House on Orcas Island. The short and quick..I looked extensively for a rental on Orcas and was very pleased with this house. It's RIGHT on the marina..and has a grassy field directly in front of it for soccer, frisbee or taking walks. We could put our kayaks right into the water and paddle out, there were tennis courts (albeit a little mossy) five minutes away and the grill makes a mean hamburger and fries. The actual house was fully stocked with whatever you might need so you don't need to pack extra. If you're a technology freak, you've got internet access, one small tv downstairs but nothing upstairs. The beds were GREAT..feather for the two boys and a memory foam for the master...our only real downside was that there was one bathroom that was UPSTAIRS. It felt like Cape Cod....small and intimate..Pottery Barn furnishings, white wash and a good kitchen. It's five minutes from great hiking and everything about it was EASY. One note about shuts down at 8pm and Sundays are dead so plan accordingly. Roses has great croissants, Inn at Ship's Bay is where the locals sent us and the Saturday market has a lot of kale..not a lot of fresh veggies. We would stay here again and would suggested it for no more than four people..might get a little cramped on the sofa. Enjoy! This was our 5th visit to the Newhall House and it will not be our last. We hope to find a time when we can stay for a month or two, we love it that much. The only thing that we would say is that we left very little for the cleaning person to do - we washed most of the towels and the sheets on the twin bed, wiped down the counters in the kitchen and did some vacuuming upstairs and downstairs. AND, we are not great TV watchers, but the TV is so old that we could not read subtitles on it on DVDs. We left a paper that indicated that the toilet float sticks and the stopper in the bathroom sink does not work. We are glad to know how much you enjoyed this special home and hope to see you soon! Thanks for the feedback on the plumbing. My family and I stayed there during the off season and had great time. The house is small and very cozy with a great kitchen. Great house and beautiful location. Will stay here again. The Newhall house was beautiful and very comfortable. The location was terrific--close to Moran State Park (great for the kids), quiet w/ beautiful sunsets/moonrise. The house itself is straight out of a Pottery Barn catalogue, but also feels welcoming and fun for all members of the family. We're already planning a return trip! I didn't really know the home was right across from the Rosario Marina, so had a great view of the water. Maybe I missed that information in the description, if not, then it should be added. This house was where my daughter and the bridesmaids dressed for the wedding, and it was a wonderful place to be. We had the MOST amazing experience at the Newhall House. The history of the home is fascinating, the decor is like something out of a magazine and oh, so comfy. The scenery out the windows makes you just want to stay put and soak it up. The deer that wander by throughout the day are just amazing. The thoughtful library of books, videos and games made every moment count for our family of four. We would stay here again in a heartbeat. It was our favorite vacation house EVER. We are so happy you enjoyed your stay in this wonderful home and look forward to welcoming you back! Our family stayed at the Newhall House in February for one week. It was a great home for a young family and our whole stay was very comfortable. We loved every minute and will be back again if at all possible! My husband I and I were just married on Orcas and stayed in the Newell house. We loved it. The house was so cute and cozy, and the Rosario grounds are beautiful. We will be back to visit again for sure! NEWALL HOUSE- was one of the top 5 places we have stayed. I have professionally staged homes, and my wife is an artist, so we tend to be picky, we were so impressed with this place, it was exactly what we needed for a relaxing time. There were suprises like the deer, the walk to the lake out of our back door, the privacy..
We were very happy with this property. Just one bit of feedback -- although the staircase is all part of the charm of this wonderful cottage, I slipped and fell down them. Maybe some non-skid tape at the edge of the treads would help? We love the Newhall house. Great Location. The view is amazing! The house is lovely. The deer are friendly. 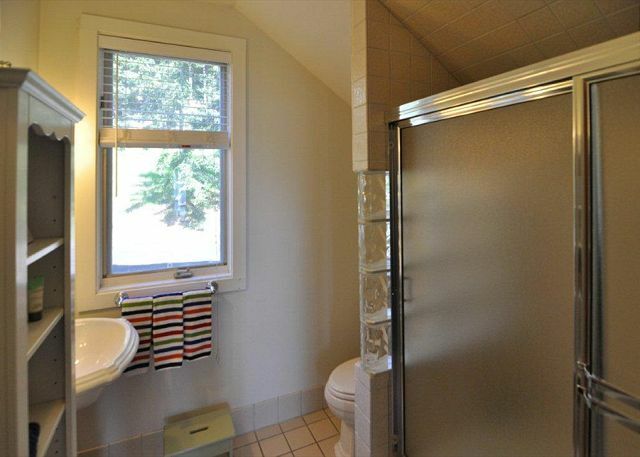 The pictures of this rental property are what drew me in. The actual property was better than even the pictures showed! I plan on returning here as soon as possible. It was wonderful! We have stayed at the Newhall House 3 times now and have loved each and every stay. The views from the livingroom and bedroom are matter what kind of weather. We have been there in early summer, fall and early spring. All seasons have been fun.